points of sale and cashing with simplicity. This software is intended for all businesses, from the mono store to the chain of stores. Easily manage your point of sale! You enter sales via your touch screen and barcode. All modes of payment are possible. You can follow minute by minute the statistics and the hit parade of your sales as well as the turnover generated by your sellers, in your shop or in your chain of stores. Create your customer file and build loyalty through marketing operations. Analyze your sales and optimize your inventory with automatic restocking that predetermines your future needs based on sales made in recent weeks. Digitize your point of sale! 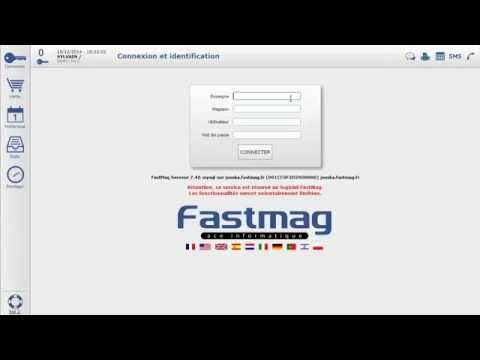 Fastmag Mobile Manager allows you to supervise the activity of your stores and to consult in real time the turnover, the sales, and the performance of the sellers. Fastmag Mobile Sales is a mobile application that allows your sellers to sell from a smartphone and visualize available stocks in real time. Fastmag is more than software, it's a team that trains you and accompanies you in all your projects.